Does anyone else pretend like they’re on a cooking show when you’re in the kitchen? You know, talk out loud as if you’re narrating your own show…. Or try to race against the clock to cook/bake something in 5 minutes…. Well, if you did ever time yourself, these Clams with Ginger and Lemongrass would be the perfect dish because they’re done in flash! You can easily be in and out of the kitchen in less than 15 minutes—even faster if you have your fishmonger clean your clams for you. And for the record, I not only time myself when making this dish but also talk to my puggle as if she was the audience in my live cooking show. She thinks I’m hilarious. Heat a wok or large skillet over medium heat and add the oil. Once the oil is hot, add the garlic, shallots, lemongrass, ginger, and chilies–stir-fry for 30 seconds. Carefully stir in the wine, fish sauce, and scallions. Add in the clams, stir the contents, and cover with a lid. Allow the clams to cook for 4-5 minutes or until the shells have opened. 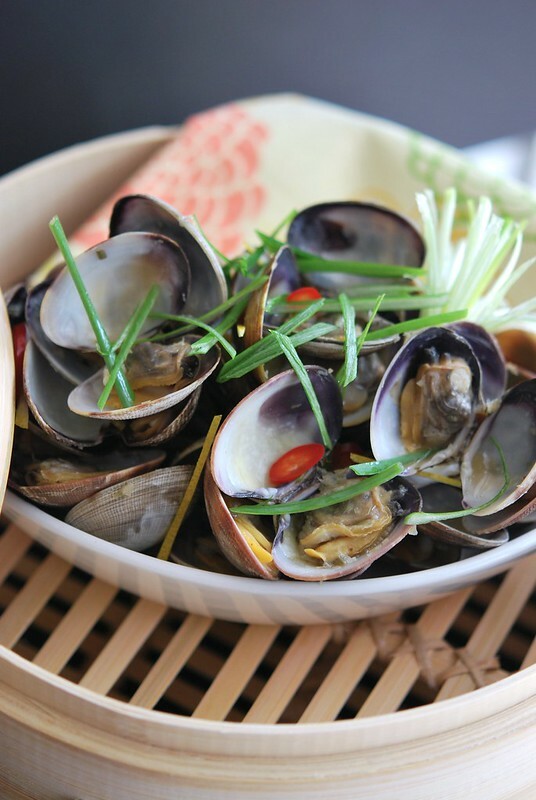 Plate the clams and garnish with scallions and cilantro. . I like this recipe because of its simplicity. I try it out! !